Until comes the spring with song, with light. BALTIMORE (JTA) — The person who penned these evocative images, in rhyme and language that this column’s author can but poorly capture in translation, was Sara Kucikowicz. As we in chilly climes nod knowingly at the poet’s words, a reality far crueler than her frigid winter strikes: Kucikowicz, a teenage victim of the Holocaust, experienced far too few seasons. A warm gesture, though, comes courtesy of a 93-year-old Jerusalem resident, Shlomo Achituv. He knew Kucikowicz in their native Luniniec, Poland (now Belarus), where he tutored her and other students in such subjects as Latin, history, literature, math, even Talmud. Achituv’s work enabled him to save the funds he needed to leave for prestate Israel. On May 5, 1939, Kucikowicz gave her tutor a photograph of herself and on the back inscribed the following: “Shlomka, so you’ll remember me. 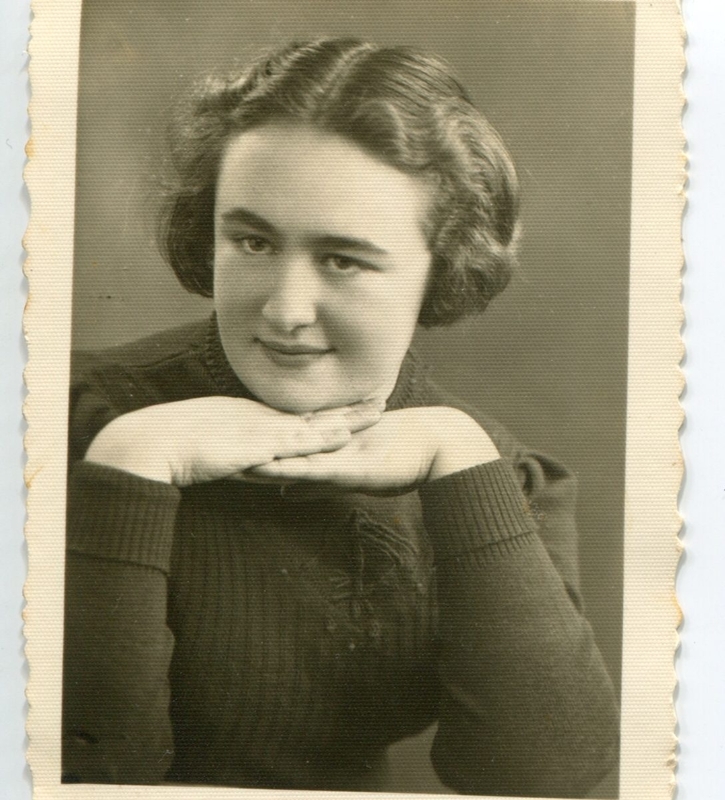 Sara.” The portrait was made at the M. Glouberman photo studio at 12 Pilsudskiego St.
Achituv, whose surname in Poland was Chwatiuk, wants to find Kucikowicz’s sister, Aliza Dworkin, so he can present her or a family member with the photograph. He also will present a 10-page tribute to Kucikowicz that appears in a memorial book on Luniniec, a town near Pinsk. Many such books were published after the Holocaust by survivors of destroyed communities. “If there’s an interest, I’d be happy to return it to them because they’re her family,” Achituv, speaking of the picture and book excerpt, said from the home he and his wife of 66 years, Miriam, share in the Israeli capital’s Ramot Eshkol neighborhood. Achituv remembers a bit about Kucikowicz: that she was two or three years younger and also attended the town’s Tarbut school, one of a regional network of institutions with a strong Hebrew-Zionist, Modern Orthodox orientation. “I can see her in my mind’s eyes. She came to our house, and I’d give lessons,” Achituv said. His two years as a tutor launched Achituv’s long career as an educator. He went on to teach at the Hadassim Youth Village near Netanya, where his students included such future notables as Knesset speaker Shevach Weiss and actress Gila Almagor. He later earned a master’s degree in school administration at Columbia University’s Teachers College and worked for Israel’s Education Ministry. Achituv fled Luniniec ahead of the Soviet advance in September 1939, reasoning that he could more easily reach Israel from Lithuania. He lived in Vilna, Ponevitz and Kovno until early 1941, then traveled by train to Odessa and by ship to Turkey and on to Haifa. Achituv’s brother Gershon, who left home in 1937, greeted him at journey’s end. The rest of their family — their father, Yaakov-Dov, who owned five multi-family homes that he rented out; mother, Nina (nee Swirsky), who ran a small grocery business; another brother, Moshe Leib; and half-sisters Basia and Rachel — was murdered in the Holocaust. Last year, while going through a photo album from his four grades as a student at the Tarbut school, Achituv noticed Kucikowicz’s photograph. He decided to learn more about her. The Luniniec memorial book on Achituv’s shelf had much to tell him. Dworkin, Kucikowicz’s sister, apparently reached prestate Israel in 1937 and settled in Haifa; her husband might have been named Moshe. After Achituv was interviewed last fall on the Israeli radio program “Hamador L’chipus Krovim” (Searching for Relatives Bureau), a listener tried to uncover information on the Dworkins’ residence in Haifa or even of their having died there. His unsuccessful effort led the listener to posit that the Dworkins may have relocated to another country. Achituv hopes that a “Seeking Kin” reader turns out to be a relative of Dworkin. He recently met people named Kucikowicz who reached Israel in the 1990s and have roots in Luniniec, but the immigrants could not be sure that they are Sara Kucikowicz’s relatives. As he considers her short life, Achituv thinks of the glowing remarks penned by Daniel Persky, editor of the Hebrew-language newspaper Hadoar and its sister publication for youth, Doar L’Noar, both of which were published in New York until going out of business less than 10 years ago. Persky published several of Kucikowicz’s poems and short stories on nature, the seasons of the year, Jewish holidays and the clandestine immigration to prestate Israel. She also wrote of her longing for the land of Israel. Correspondence with her sister and with Persky appears in the Luniniec memorial book. It reveals that Kucikowicz, like Achituv, tutored students; after completing her formal education, she studied to be a librarian, but could not land a job. In a letter to Persky, Kucikowicz said that Dworkin tried to bring her to prestate Israel. “I think day and night of coming to Israel, but the destination is so far-off,” Kucikowicz wrote to her sister. “In my opinion, Sara Kucikowicz’s future will be that of a great Hebrew poet,” Persky wrote to Dworkin on Oct. 6, 1935, in a letter hinting of Dworkin’s role as an intermediary between poet and publisher. In a May 6, 1947, letter to Yosef Zeevi, Persky suggested the special section be devoted to her in the Luniniec book that Zeevi was compiling. Lifted its legs and fled from our place. One cannot help but be struck by the notion that her words — and the two poems’ titles — mirrored both the cannibalism that would consume the poet and the protective embrace, unconsummated, awaiting her in Israel.